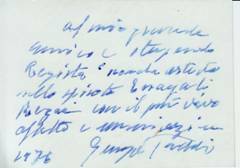 For more than thirty years, I kept my diary and the programs from Roudaki Hall, along with autographed photos of Giuseppe Taddei, and Maestro’s short note from my scrapbook, Tehran 1976, which I permit myself to share with the readers. 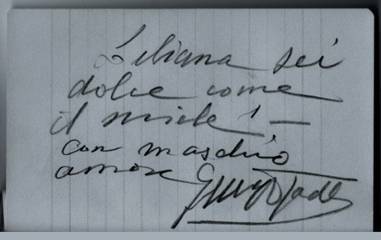 Giuseppe Taddei autographed dedication to Liliana in Tehran, 1976. Courtesy Liliana Osses Adams, private collection. 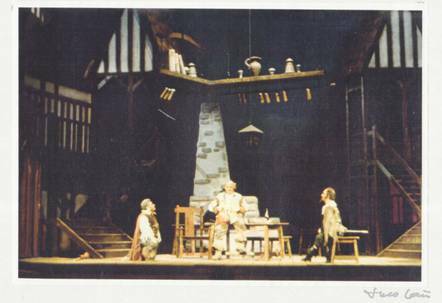 In the season 1974-75, Giuseppe Taddei gave four performances of Verdi’s Falstaff, staged by Lotfi Mansouri and conducted by Kenneth Montgomery, dates: February 5, 8, 11, and 15, 1975. Giuseppe Taddei as Falstaff in the production at Roudaki Hall, February 1975. Director Enayat Rezai and Robert Kerns as Ford. Tehran, 1975. Courtesy Enayat Rezai, private collection. Giuseppe Taddei as Falstaff and Enayat Rezai. Tehran, 1975. 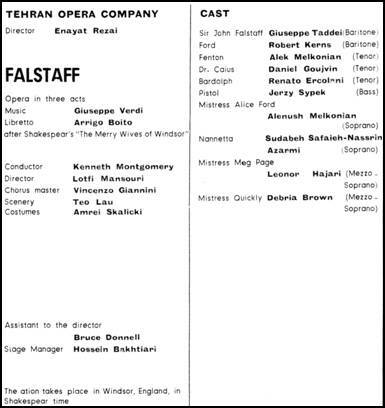 In the season 1977-78, Giuseppe Taddei returned in triumph as Falstaff in three reprise performances, conducted by Farshad Sanjari, dates: December 10, 12, and 13, 1977. 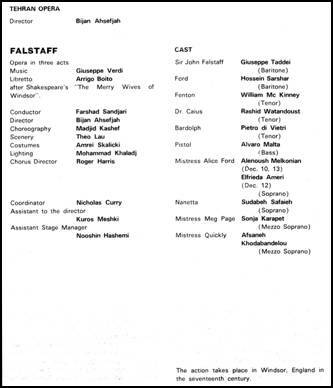 On December 17, 1977, the performance of Falstaff (with the same cast) was recorded live by the National Iranian Radio and Television (NIRT) under Farshad Sandjari, in the series of the Roudaki Hall’s Productions for TV, directed by Monir Vakili. La Cenerentola, conducted by Paolo Peloso, dates: January 31, and February 3, 6, and 8, 1976. 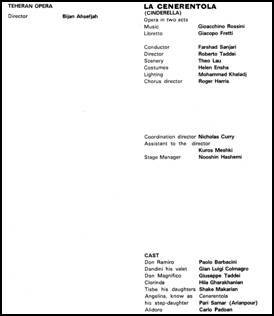 In the season 1975-76, Giuseppe Taddei appeared in two performances as Rigoletto in the title role of Verdi’s Rigoletto with Luciana Serra as Gilda, conducted by Rudolf Kruger, and directed by James Conrad, dates: February 12 and 14, 1976. 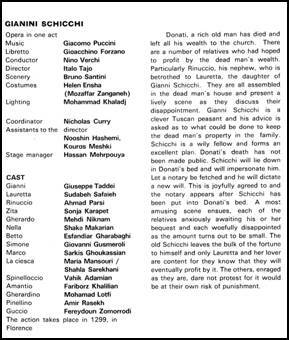 It was Giuseppe Taddei’s second appearance in the season at Roudaki Hall, following the role of Dandini in Rossini’s La Cenerentola. At the end of the season 1975-76, Bijan Ahsefjah (Assefjah) replaced Enayat Rezai, who left his post after eight years as director, producer and also opera singer in baritone roles. 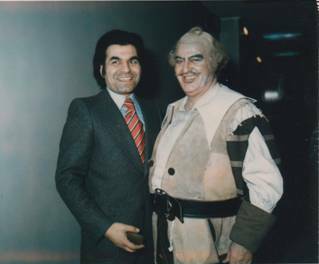 In February 1976, Giuseppe Taddei autographed the photo for Enayat Rezai after his performance as Rigoletto in remembrance of their extraordinary efforts in creating stage performances in the most unusual – one would think – surroundings. Giuseppe Taddei autographed photo to Enayat Rezai. Tehran 1976. In the season 1977-78, Giuseppe Taddei appeared in four performances as Gianni in the title role of Puccini’s Gianni Schicchi in the production of Italo Tajo, conducted by Nino Verchi, dates: October 13, 15, 16, and 19, 1977. He was genuinely funny as Gianni and enthusiastically cheered by Tehran’s audience. 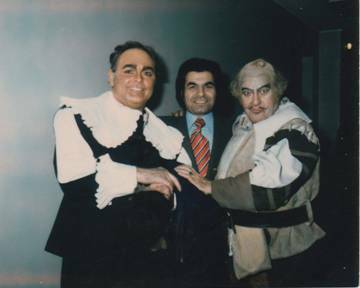 In the season 1977-78, Giuseppe Taddei appeared in three performances as Don Magnifico in Rossini’s La Cenerentola, in stage production of Roberto Taddei, and conducted by Farshad Sanjari, dates: February 2, 4, and 5, 1978. 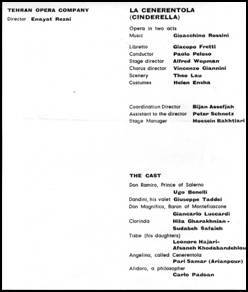 Following Gianni Schicchi in October 1977, and Falstaff in December 1977, it was Giuseppe Taddei’s third appearance in the season at Roudaki Hall. With this performance he bid farewell to Tehran. We had leisurely weekends among friends in my apartment at Ghazali Street, a few blocks from Roudaki theatre. At the kitchen, Maestro Taddei often created the aromatic performances of spaghetti dishes. Served with good wine, we enjoyed the fine meal with three famous Genovese – Luciana Serra, Michele Casato, and Signor Taddei – “our Peppino”. 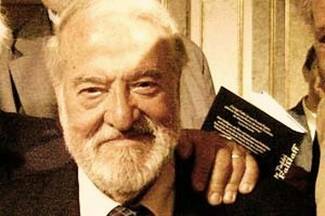 Long time associated with the Tehran Opera Company, passed away Michele Casato became a vocal coach to the comprimarios and a mentor to singers of the minor roles. He delighted his many fans with comic skills as Gianni Schicchi, and as Don Annibale di Pistacchio in Donizetti’s Il Campanello with Luciana Serra as Serafina, in Donizetti’s L’elisir d’amore as Dulcamara with Luciana Serra as Adina, and as Bartolo in Rossini’s Il Barbiere di Siviglia with Luciana Serra as Rosina. Luciana Serra, the versatile soprano and Tehran Opera Company residing artist appeared as Gilda, Adina, Serafina, Rosina, and the Queen of the Night. Critics and audience alike described in fine superlatives her last performance as Lucia in Donizetti’s Lucia di Lammermoor on June 1, 1977. Soon after, she left Iran. On October 11, 1987, Luciana Serra mesmerized the San Franciscans in the role of the Queen of the Night in Mozart’s Die Zauberflöte. We greeted each other with open arms and I was very happy to see Luciana once again. In the Fall of 1975, Herbert von Karajan visited Iran with the Berlin Philharmonic. 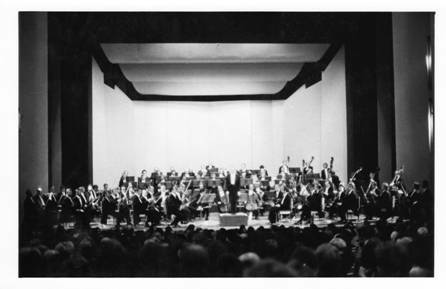 The program of two concerts open to the public at Tehran’s Roudaki Hall, on November 8 and 11, 1975, included: Mozart’s Haffner symphony No. 35 in D major, K. 385, Brahms’s Second Symphony, Ludwig van Beethoven’s Fourth and Fifth symphonies, and Richard Strauss’s Till Eulenspiegel. The third performance was given in the presence of Their Imperial Majesties and their invited guests on November 9, 1975. Herbert von Karajan and Berlin Philharmonic. 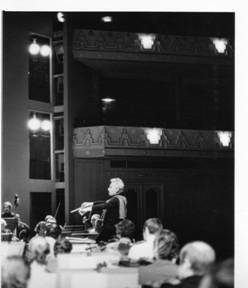 Herbert von Karajan and Berlin Philharmonic in Tehran. November, 1975. The rehearsal at Roudaki Hall. November, 1975. Courtesy Liliana Osses Adams, private collection. 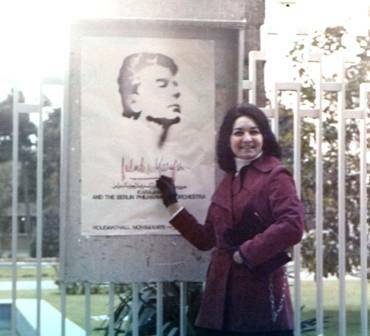 Herbert von Karajan’s poster at Roudaki Hall.Tehran, November, 1975. Giuseppe Taddei was born on June 26, 1916 in Genoa. Destined for a long and successful career, at an early age he entertained his parent’s friends. Soon after, the young Guise charmed the crowds of passers-by singing at the steps of the churches to raise money for books for his poor class-mates. He began voice lessons with Maestra Giuseppina Lusso at the elementary school and was chosen to sing solo-parts at school presentations. On April 16, 1932, at the age of sixteen, he appeared for three performances at Genoa’s Teatro Carlo Felice in the role of Don Basilio Perdifiato in Pallastrelli’s Il Gatto Stivalato. At the age of nineteen he won a vocal competition in Rome sponsored by Teatro Reale dell’Opera (Royal Opera House), next to none other than Mario Del Monaco. Soon therefore, on 26 December 1936, he made his promising début at the age of twenty at Rome’s Teatro Reale as Wagner’s Herald in the production of Lohengrin under Tullio Serafin. Ten years later, on May 28, 1946 he made his second début outside of Italy as Verdi’s Rigoletto in the Vienna State Opera. From May 28, 1946 to January 2, 1949, he was engaged as a regular member of the Vienna Opera ensemble, in the city occupied by the Allied forces and subdivided into four zones. At that time, he was singing his full repertory in Italian, including the role of Escamilio when all performances – at the temporarily used stage of the Theater an der Wien – were sung in German. Later on, from October 1960, in the reconstructed Staatsoper an der Ringstrasse, he took the roles of Iago, Scarpia, Rigoletto, Amonasro, Figaro, Simon Boccanegra, Gianni Schichi, and Falstaff, dominated by Tito Gobbi – his mentor, whose friendship began when Giuseppe Taddei sang in 1937 at Tito’s wedding, and would last until his death in 1984. For Maestro Taddei, Vienna was a second artistic home where he was adored by the Viennese, who proudly called him the “Viennese singer of Genoa”. During 44 years, starting as early as 1946 through 1990, he sang 431 performances of 27 roles, receiving after each performance standing and spontaneous ovations. It was also in Vienna where Giuseppe Taddei’s close artistic relationship with Herbert von Karajan began. 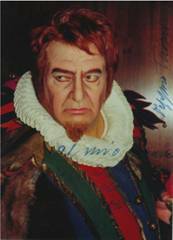 In 1948 at the Salzburg Festival under Herbert von Karajan, Giuseppe Taddei debuted in the title role of Figaro in Mozart’s Le Nozze di Figaro. During Herbert von Karajan’s artistic directorial at the Vienna State Opera (1957-1964) the cooperation between the two artists became more and more sublime and inspired by their grandeur and perfectionism, their artistic attachment, esteem and friendship would endure until Herbert von Karajan’s death in 1989. Giuseppe Taddei’s well controlled dark voice of warm color had the ability to portray many different qualities, especially in the roles of “Verdi baritone” – both tragic and villainous, along with Mozart’s basso buffo roles with comic flair, and the Wagnerian bass-baritone roles. He was a naturally born great actor always looking at the musical aspects of his performances. His repertory included more than one hundred and fifty operatic roles and his artistry had deeply influenced the next generations of baritones. His vocal mastery and solidity of his technique allowed him to continue singing into old age. On September 25, 1985, at the age of sixty-nine, he made his début at the Metropolitan Opera in New York, where he sang eleven performances in the title role of Verdi’s Falstaff, conducted by James Levine. On February 17, 1988, at the MET, he sang four performances as Il Dottor Dulcamara in Donizetti’s L’elisir d’amore. 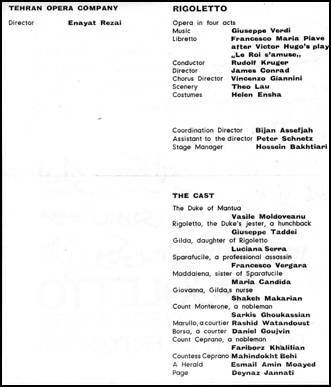 After four months, on June 21, 1988, he returned to the MET as Dulcamara for six open-air performances in Central Park, opposite Kathleen Battle as Adina, and Luciano Pavarotii as Nemorino. In the role of Dulcamara, he made his adieu to the MET, although five years later, in 1993, he sang Geronte di Ravoir in Puccini’s Manon Lescaut with Mirella Freni as Manon and Luciano Pavarotti as Des Grieux, recorded under James Levine. It was his last of 62 recordings. His impressive discography with a wide range of repertoire, spans from 1941 to 1992, and often partnering with famous interpreters, leaves a vivid legacy of Giuseppe Taddei. However, his early recordings on Cetra label have had a limited circulation outside of Italy. The Viennese Preiser Records label began distribution of his recordings remastered from the original shellac records. Retired from the stage in 1995, he gave his ultimo performance as Benoit in Puccini’s La Bohème, conducted by Gianluigi Gelmetti at Teatro dell’Opera in Roma on June 25, 2003. To celebrate Maestro’s 90th birthday, the Amalthea Signum Verlag in Vienna published in May 2006 his memoires titled: Ich, Falstaff Erinnerungen, in narrative by Peter Launek, his son-in-law. When Giuseppe Taddei was once asked what characteristic made a good Sir John Falstaff, he replied with his famous sense of humor: You must like women, a good wine, and a good meal. Giuseppe Taddei signed his book in Vienna, 2006. Photo released as public domain. For sixty years he travelled around the globe to further his international career – always giving successful performances applauded with thunderous ovations – on the opera stages from North to South America, from Ireland to Greece, from Iran to Venezuela, from Japan, Mexico to Puerto Rico, from Luxemburg, Switzerland to Spain and Portugal, from Germany to Hungary, from Milan to London, and Paris to Rome. Loving husband to Maria Antonietta Laureti, devoted father, dearest friend, loyal colleague, magnanimous and charismatic, creative and witty, blessed with vocal longevity and a passion for life, Giuseppe Taddei, the great Italian baritone passed away on Wednesday, June 2, 2010, at his home on via Trionfale in Roma, Lazio. He will be dearly missed. Repose in Peace, our Maestro.